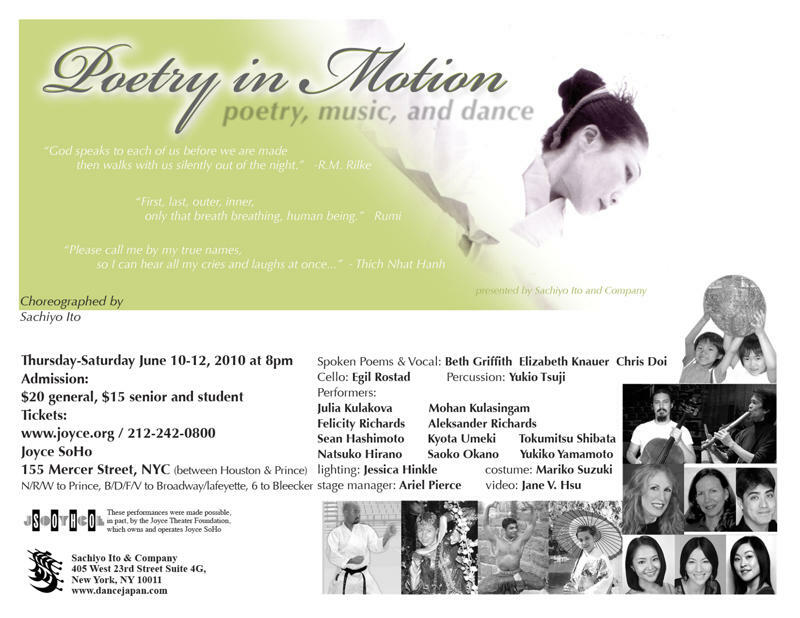 Poetry in Motion is a collaboration of dance, poetry recitation and music. Created by award-winning New York City based Japanese dancer and choreographer, Sachiyo Ito, it fuses together music, dance and poetry drawn from ancient and modern sources. Presented through dance, the language of the soul, it aims to deepen and strengthen the connection within ourselves, with others and the world. Selected poems include “Chieko-sho” by Japanese modern poet Kotaro Takamura, “Before the Beginning” by Rainer Rilke, “Please Call Me by My True Names” by Thich Nhat Hanh, “Summer Day” by Mary Oliver, and “Only Breath” by Rumi. Guest singers and musicians include Beth Griffith, Elizabeth Knauer, Egil Rostad, and Yukio Tsuji. The program offerings include two revivals from the 80s and 90s. Please Call Me by My True Names is a revival of the 1981 Joyce SoHo production originally entitled as An Invitation to Bell, which was reproduced at Lincoln Center in the same year. The dance is based on a poem written by Thich Nhat Hanh about a young boat refugee raped by a sea pirate. The year 2008 marked the 30th anniversary of the poem, but the condition of our society has changed little and Hanh’s voice of humanism is still resonant today. Day to day, we are surrounded by tragedies, the adverse conditions of our own humanity and violence stemming from hatred and prejudice. We are in need of finding inner balance and Please Call Me by My True Names invites the audience to contemplate together on a message calling for compassion, reconciliation and inner harmony–the basis for world peace. Another revival is Chieko: the Element, choreographed to the contemporary poem, “Chieko-sho.” The piece was originally produced in 1985 at Japan Society and the poem will be sung and recited to a score set by Dan Erkkila. The ensemble piece, Only Breath, features dancers from various disciplines, cultural backgrounds and ethnicities. The dance calls for the coming together of all humanity on earth to form a global village surpassing boundaries of east, west, and other geographical, cultural, and social differences. Lively Okinawan folk music and dance will be performed while there will be an audience participation in Kachashi, the improvisation dance, uniquely Okinawan. 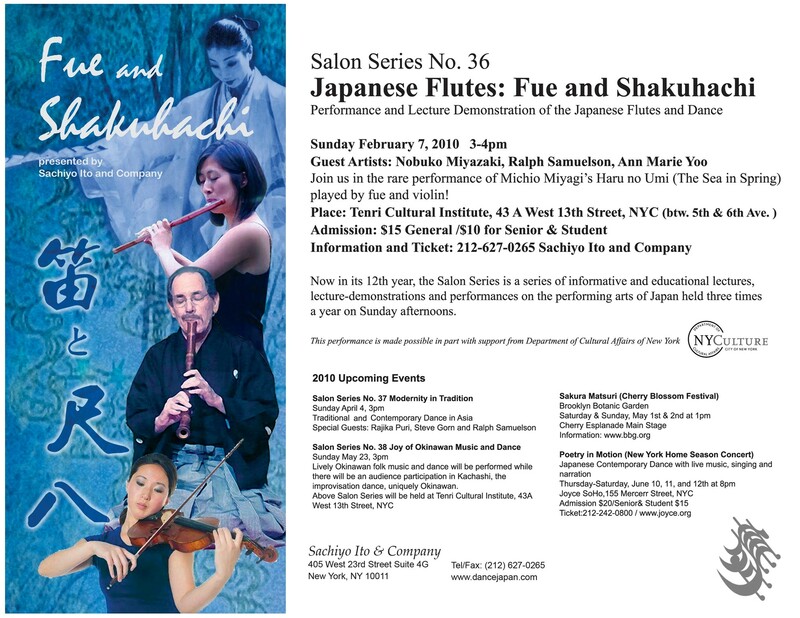 Now in its 12th year, the Salon Series is a series of informative and educational lectures, lecture-demonstrations and performances on the performing arts of Japan held three times a year on Sunday afternoons at Tenri Cultural Institute. Traditional and Contemporary Dance in Asia. Special Guests: Rajika Puri, Steve Gom and Ralph Samuelson. Guest Artists: Nobuko Miyazaki, Ralph Samuelson, Ann MarieYoo. Join us in the rare performance of Michio Miyagi’s Ham no Umi (The Sea in Spring) played by fue and violin!